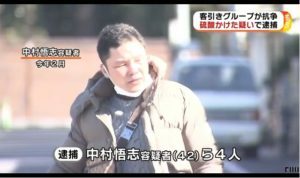 FUKUOKA (TR) – Fukuoka Prefectural Police are seeking the help of the public in locating the man who robbed a convenience store in Fukuoka City late last year, reports TV Asahi (Jan. 24). 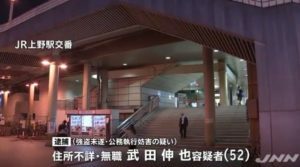 At around 4:30 a.m. on December 31, the perpetrator entered the store, located in Hakata Ward, and approached the register after selecting a drink from a refrigerator. In security camera footage provided by police, the perpetrator is shown beginning to pay for the item at the register while slowing pulling a knife out of his back pocket. After thrusting the knife forward, he grabs cash from the register. 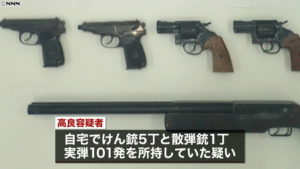 After the clerk grabbed the weapon, the perpetrator fled with about 65,000 yen in cash. The clerk suffered minor injuries, police said. 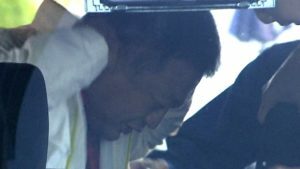 Believed to be in his 20s, the perpetrator stands about 170 centimeters tall. 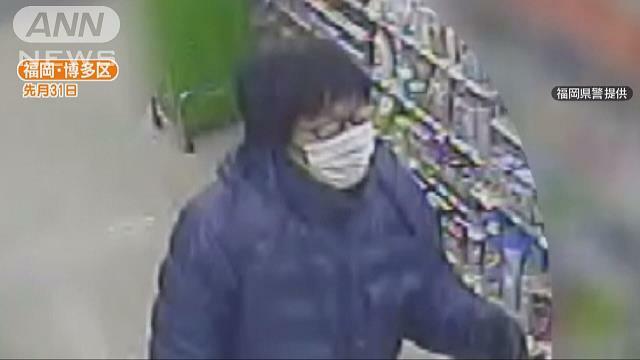 At the time of the incident, he was wearing black glasses, a blue jacket, jeans and a white breathing mask.